If you want to really know what’s going on in the woods, talk to a hunter. It’s hunters who are off trail and hunters that will discover things in places most people never go. Take the story of a few hunters in upstate New York who recently discovered a ruptured natural gas pipeline. 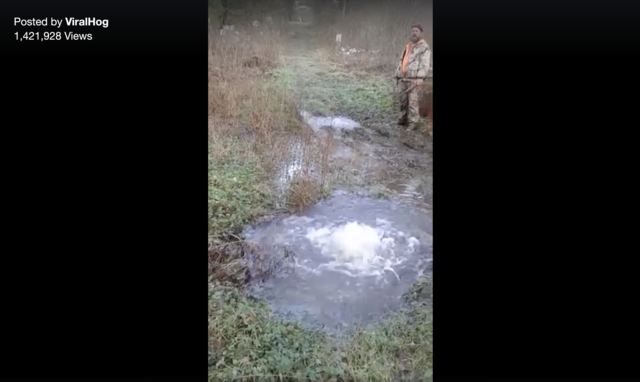 The leak was visible as it bubbled up through a puddle of groundwater in the pipeline right-of-way. A video of the encounter quickly drew attention on social media and the Youtube video was picked up by Viral Hog. The hunter who spotted the leak outside Franklinville reported that he called the gas company, which reported they couldn’t do anything about it until after Christmas. The story is particular interest to those following the drama around the Dakota Access Pipeline in North Dakota. “This is why North Dakota doesn’t want that stupid pipeline,” Ryan Weatherley can be heard saying in the video.